Only a decade ago, Surprise's new 10,500-seat stadium could have seated every man, woman and child living in the city with room to spare. Today, Surprise's population of 58,000 is a booming testament to West Valley growth, and its new stadium is the cornerstone of what city fathers hope will become a thriving hub of activity amid the westward sprawl of residential developments. On Saturday, the city's Surprise Party will mark the opening of a Cactus League spring training facility and a Northwest Regional Library at the Surprise Recreation Campus. Surprise Stadium's dedication will be a milestone of sorts not only because it signals the city's coming of age, but because it is the first major venture funded by the state Tourism and Sports Authority to come to fruition. "We're beginning to form a true city," Mayor Joan Shafer said. "What it means to us is, our quality of life is picking up." Major League Baseball's Texas Rangers and Kansas City Royals have begun moving spring training operations from Florida to Surprise in preparation for the first pitch of spring training in February. Within steps of the stadium's Billy Parker Field, each team has a two-story, 37,000-square-foot clubhouse with locker rooms, team kitchens, weight and training facilities and administrative offices. Each team also has a practice infield and six full practice fields surrounding the stadium where their major- and minor-league players will workout. The stadium itself sports everything from cheap lawn seats in the outfield to pricey second-story club seating behind the dugouts. Several corporate suites also will be available during the 28-game spring training season. If the action on the field and a glorious view of the Bradshaw Mountains isn't enough to keep fans entertained, batting cages on the concourse can take up the slack. Local amateur teams will have occasional access to practice fields, while youth sports teams will have full use of lush turf north of the stadium that doubles as overflow parking. Mark Coronado, Surprise's director of community and recreation services, said the city expects spring training activities to finance about 60 percent of the stadium's $2.3 million annual operating costs. Officials expect 6,000 to 7,000 spectators per game, with ticket surcharges feeding city coffers. Other events also are planned. For example, Arizona State University will host a four-team college baseball tournament there in mid-February. A $700,000, 16-foot-by-20-foot scoreboard and television screen in the outfield can be used for closed-circuit or pay-per-view sports events as well as things like family movie nights or a symphony under the stars. "We've always told the (city) council, this will be more than baseball," Coronado said. "We'll be very disappointed if we're not using it two-thirds of the year." The sports authority originally allotted $26 million to the $48.3 million project, with the city funding the rest. The sports authority revenues are fed by hotel-bed taxes and a rental-car surcharge approved by Maricopa County voters. The 30-year tax will finance a $355 million Arizona Cardinals football stadium in Glendale, but about $200 million also was earmarked over that period to finance capital improvements for the 12-team Cactus League. An unexpected glitch developed last year when West Valley developer John F. Long filed suit to challenge the constitutionality of the stadium taxes. The ongoing litigation has kept the sports authority from marketing construction bonds, leaving it unable to pay its full share of the Surprise stadium's tab. Instead, the city rearranged its capital projects so it could finance the bulk of construction itself, with the understanding that the sports authority would pass on $250,000 in monthly revenues to the city and increase its total commitment to the project by $6 million, for a total of $32 million. Once Long's lawsuit is resolved, the sports authority intends to market bonds to pay off its portion of the Surprise project and end the monthly payments, sports authority President Ted Ferris said. Though the Arizona Court of Appeals has rejected Long's legal arguments, the Arizona Supreme Court will decide Tuesday whether to review the case. If it does not, bonds could be on the market by next month. Ferris praised the city for taking on an added financial burden and risk to keep the stadium construction on schedule, noting that it was imperative since the Royals and Rangers ended their Florida leases to make the move. "We had to get the deal done," Ferris said. "It showed great commitment on their (Surprise's) part." Surprise has an interest in its success beyond luring money-toting baseball fans. 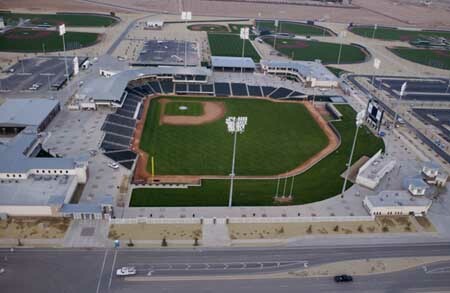 The stadium, a new high-tech library run by the Maricopa County Library District and the city's state-of-the-art aquatic center next door form the core of the Surprise Recreation Campus, which is the first phase of the city's plan to develop Surprise Center on a square-mile of desert where Luke Air Force Base's auxiliary field once stood. City officials envision the 200-acre recreation campus anchoring the western side of a city hub that includes government offices and a community park and lake. Maricopa County has built a court facility at the site's eastern edge. Coronado marveled that the entire concept sprang to life from simple plans in 1999 for a 23-acre recreation facility. "Recreation can be an economic catalyst," Coronado said. "It seemed like all the pieces just started to fit for us conveniently. It was all about timing."